Great texts to ponder upon. Find inspiration in these Bible verses about God's love: John 3:16, Lamentations 3:23, Psalm 86:15, 1 Corinthians 16:14, Ephesians 2:4-5, John 3:17, Psalm 46:1, Isaiah 54:10. This set of bookmarks is a great way to be reminded once a day that the love of God is the most important love of all. These are very easy to carry with you at all times, thus you can always have the word of God in your pocket with our inspirational Bible card set. If you are trying to find the best Christian gifts at an affordable price, this bookmark package is a perfect option. These full-color bookmarks are a great way to mark your page and a source of encouragement during tough times. Our page markers are made from quality material, very lightweight and colorful designs. They can be a fun gift or a great teaching resource for the church family or other friends, and neighbors too! 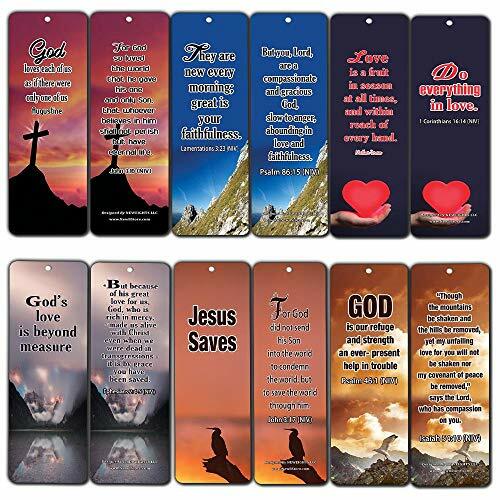 Popular Bible Verses about God's Love Bookmarks (60 Pack) - John 3:16, Lamentations 3:23, Psalm 86:15, 1 Corinthians 16:14, Ephesians 2:4-5, John 3:17, Psalm 46:1, Isaiah 54:10. Great way to encourage yourself or others and very useful witnessing tool. Premium Quality - made from quality materials as they are made with solid 5.5 oz matte card board paper with double-sided water resistant coating. Reversible bookmarks. Front and back of the bookmark displays the quoted inspirational texts that are designed to encourage the user. Great inspirational and encouraging gift idea. Bookmarks are a great gift for any loved one or friends. If you have any questions about this product by NewEights, contact us by completing and submitting the form below. If you are looking for a specif part number, please include it with your message. B&W BOOKISH QUOTE Bookmarks - Set of 30 - Bookmarks for Kids girls boys teens. Perfect for Gifts - School Student Incentives – Birthday Party Supplies – Reading Incentives - Party Favor Prizes!